In 12-inch nonstick skillet, cook bacon until crisp; drain on paper towel. 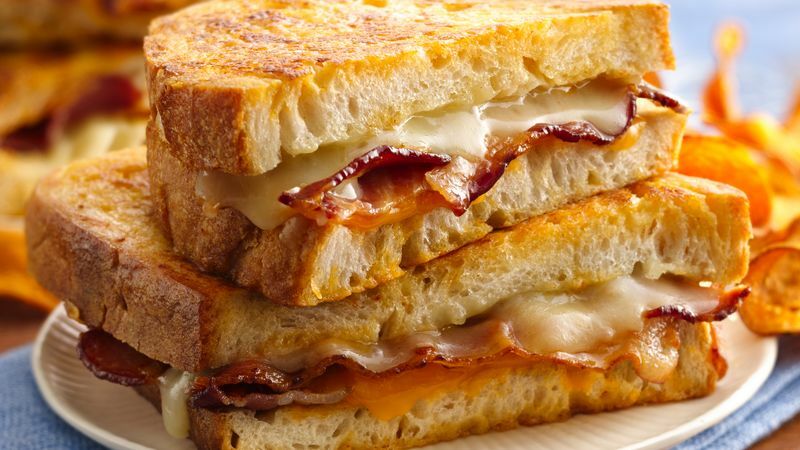 On 2 of the bread slices, place 1 slice provolone cheese, 3 slices bacon and 1 slice Cheddar cheese on each. Top with remaining bread slices. Heat griddle or skillet over medium-high heat or to 375°F. In shallow bowl, beat egg, beer, flour and chili powder with fork until smooth. Dip each sandwich into batter, giving it a few seconds on each side to absorb the batter; drain excess batter back into bowl. Melt butter on hot griddle. Place sandwiches on griddle. Cook 3 to 4 minutes on each side until golden brown. If you need to serve a crowd, this recipe can be doubled or tripled. Prepare all of the sandwiches first and then dip in the beer batter and cook them all at once on a griddle.